On March 24th, the World Campus International participants had a lecture about Buddhism by a monk (who was also my host mother) and then took part in a series of presentations and discussions organized by the participants. In the lecture given by Ms. Okazaki, she explained to us her view of Buddhism. Quite a few of the participants from western cultures were surprised that Buddhism should be considered a religion because they had heard Buddhists say it’s more a way of life than an organized religion back at home. We learned that there are a lot of different forms of Buddhism and the one she is practicing is called Nembutsu Buddism which is based on the teachings of High Monk Shinran (1173-1262). 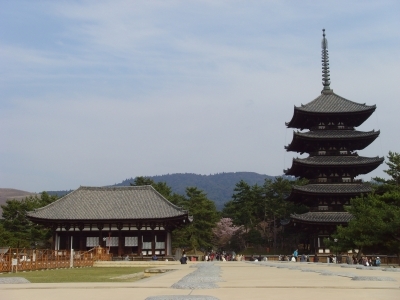 Shinran spread the teaching of the Nembutsu. The preaching of the absolute power of the other, that one need only trust entirely in Amida Buddha. He focused on the forty-eight vows of Amida and if we have faith in Amida, we have already been saved. Taking the Nembutsu as an invocation of gratitude to the Buddha, he categorically denied practices of one’s own power as superfluous. He preached absolute reliance on power of the other (= Amida), such that one is saved when one achieves correct faith. Afterwards we had presentations and discussions on other World Religions. Groups of 4 to 5 World Campus — Japan participants presented a certain religion to the others so that everyone had a basic understanding of those religions in order for us to talk about them. Those religions were Hinduism, Islam, Christianity, Judaism as well as Buddhism. Whenever possible in our discussions we did give people in our group who belonged to one of the discussed religions also a platform to explain their views of their own faith. We also asked people about the stereotypes of different religions and discussed that some religions had bad media representation and can be misrepresented. In this process we learned a lot about religions and how people from different ones can work together on a topic like religion with out having negative outcomes as seen so often in the world. In the end we also gave people who are Atheist time to speak so they could share their views too. After the discussions, everyone agreed that no one should have a bad view of someone because they have different faiths and that we should live together and respect other people’s values and belief systems. It was a great day to be able to discuss a topic which is not easy in such a kind and friendly manner with people from all around the world including the local Japanese and we all learned much and did get a step closer to understanding global citizenship. I wish that all religious leaders in the world could experience that what we did here in Uda City in Japan in our discussion about World Religions as it would really change their world as well.